Despite efforts by governments world over to stem the culture of students' unrest in learning institutions,the nature of the unrest have taken a dramatic turn for the worse.They are not only violent and destructive but premeditated and planned to cause maximum harm to human lives. whenever learning institutions experience any form of unrest, the authorities form committees& commissions in a quick rejoinder to investigate the causes with a view of ultimately punishing student perpetrators. 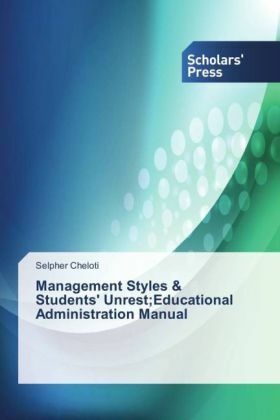 Focus immediately shifts from the root cause of the unrest to activities and participants during the unrest.This publication presents study findings that give the reader first hand information on the influence that management styles have on the behavior of the subjects.The style and language of writing is simple;adopting a thesis presentation format.This book can offer a solution to one of the greatest problems facing education sector world wide.The book is recommended for; Educational policy makers, heads of learning institutions at all levels,students of Educational Administration, Leadership& Management at Bachelors,Masters &PhD levels,parents,school Principals,teachers & university lecturers.